Any time I see an article that references causing limb movements by poking the brain with electrical signals, I think of the old The Far Side comic shown to the left. Artist Gary Larson drew quite a few hilarious operating room scenarios. Electrocution is of course not a laughing matter - unless it happens to someone else and it is not serious and no harm is done. Then - and only then - can it be funny. I've laughed at myself many times after receiving a good jolt due to stupidity. Sometimes after such an experience I wonder how I never killed myself from getting zapped as the result of being too lazy to turn off a circuit breaker before servicing a light switch or receptacle. The sad thing is that I'll probably do it again some day ("Live and don't learn, I always say."). But, I digress. 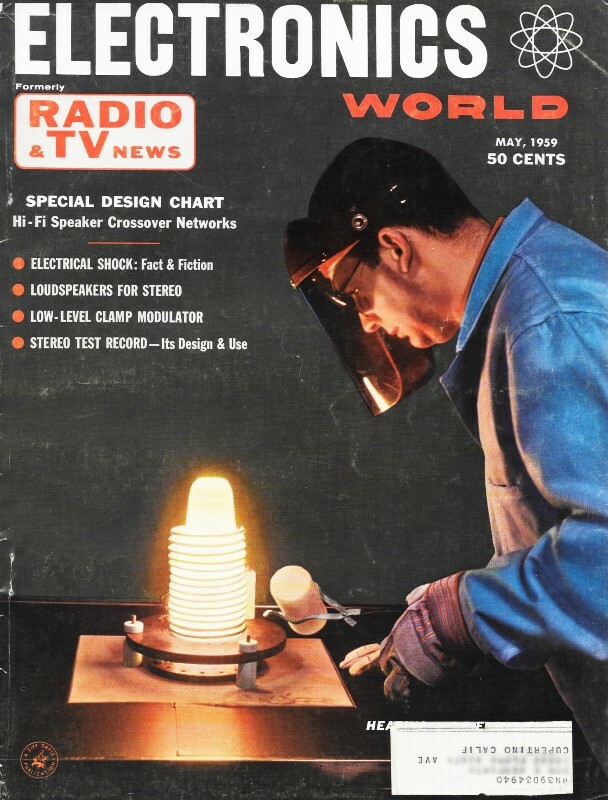 This article appeared in a 1959 issue of Electronics World magazine. It is one of many on the topic of electrocution appearing over the years. Electricity kills by burning its victims to death? Small currents are less harmful than large ones? Low voltages are not lethal? There are no harmful after-effects if you survive? If so, here is the shocking truth. Fiction: Electricity kills by burning its victims to death or "shorting" them out. Fact: Medical records prove that electrical currents great enough to cause actual burning kill less often than do currents of much lower magnitude. The notion that an electrical current "shorts out" its victim in the way that lightning can short out an electrical circuit, while closer to the truth than the "burn" theory, is still misleading. Actually, electricity kills by overriding the control that the nervous system exercises over the body. The human body has sometimes been compared to an automatic factory. Muscles are its motors. Master-minding the operation of these motors is that fabulously complicated calculator - the brain. This message center sends instructions to the controlled parts of the body via an intricate electro-chemical network we know as the nervous system. Doctors take advantage of the electrical nature of the nervous system with electrocardiographic and electroencephalographic equipment, which measure the small impulses associated with heart and brain, respectively. If overridden by an outside current, the electrical impulses of the nervous system lose control of body functions. During brain surgery, for example, doctor's have applied small potentials to various sections of the brain that have caused movements of limbs and induced mental images. Through such electrical prodding, much is being learned about the mysteries of the mind. Not so helpful, however, are the uncontrolled currents that flow during electrical shock - currents that swamp out the signals going to various parts of the body. Particularly dangerous are such currents that enter the heart and respiratory centers. Thus, a key factor in death by electrical shock is the path of the undesired current within the human body, as well as its magnitude. Death following shock is generally caused by one of two direct effects: ventricular fibrillation or respiratory-center paralysis. To understand ventricular fibrillation, we should know a little about how the heart operates. Basically, it is a pump forcing blood through the body. Controlling the heart muscles is a minute, electric current occurring periodically in the right auricle of that organ. If the conduction system of the heart is disturbed, say by an outside electric current, the muscles respond in a haphazard fashion, rendering the organ useless as a pump. Known as ventricular fibrillation, this phenomenon generally causes death since the vital body organs are not supplied with fresh blood. Respiratory-center paralysis is the second most lethal effect of electrical shock. Normal breathing is controlled by a stimulus from a section of the hindbrain known as the medulla oblongata. The electrical stimulus travels through a complex nerve network to the breathing muscles and lungs. An outside current can easily paralyze the network and cause breathing to stop. Actually death from shock can be caused by respiratory-center paralysis, by ventricular fibrillation, or by both. Fiction: Small currents are less harmful than large ones. Fact: For obvious reasons, the exact intensity of current that will cause death in a human being is not easy to determine. However, much research has been conducted in this direction. One careful study in this area was undertaken by researcher L. Alexander and published by medical organizations on this continent about two decades ago. Table 1 presents key information extracted from his report. There are other complications showing somewhat different tabulations - such factors as whether males or females are involved, whether the current is a.c. or d.c., and the methods used in research may affect the data - but the table will serve as an illustrative guide. Currents of 0.07 to 0.09 ampere generally cause death by ventricular fibrillation, if they pass through the chest. However, much lower currents can also prove fatal. 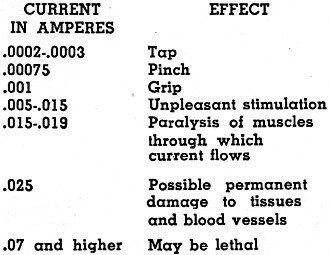 A current of only 0.015 ampere passing directly through the chest can render the victim incapable of releasing himself from the circuit, while simultaneously paralyzing the muscles of the diaphragm needed in breathing. Unless he is released from the circuit with outside help, he will die from asphyxia even though the heart and respiratory centers are not affected directly. From the chart we can also see why people say that a charged conductor "holds" its victim. Once muscle paralysis occurs, he can do nothing to free himself. However, in some cases, muscles contract with enough violence to "throw" the victim. This, of course, may cause secondary injuries if he hits something in his flight, but also may be the means of saving his life. A larger current would be more likely to do this than a smaller one. More will be said on this score later. Fiction: Low voltages are not lethal. 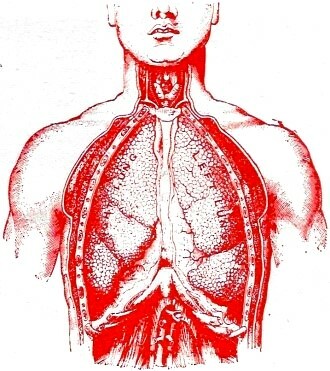 Fact: Thus far we have considered only the effects of a current passing through the body. However, voltage is the force that determines current magnitude. The amount of current for a given applied voltage, of course, depends on resistance - and the resistance of the human body varies widely. It depends, among other things, upon the path of current; the health of the individual; the duration of the current flow; the condition of the skin (wet, dry, etc. ); and the area of contact. Measure the resistance of your body from arm-to-arm under various conditions: you will find that, while perspiring freely on a warm day, the resistance is so low that 25 volts could produce sufficient current to cause death. Confirming this, there are cases on record of deaths caused by 32-volt farm lighting systems. Yet, under more favorable conditions, the 120-volt house lighting system would cause only a tingle! Fiction: High voltages are always more dangerous than low ones. Fact: Strangely enough, shock from potentials greater than 1000 volts may be less dangerous than those from lower voltages. The reason for this is that the high currents associated with high voltages may cause all muscles - including those of the heart - to contract suddenly and violently. The heart muscles may contract to such an extent that fibrillation cannot occur. In such cases, the heart may resume normal action if the victim is released in three or four minutes. A recovery rate of 62 per-cent among cases where persons were knocked out by potentials above 1000 volts was observed during a study made in 1933. The corresponding rate at much lower voltages was only 39 per-cent. Not only the voltage and current magnitudes but also the current body paths are important. Any route involving the heart or brain is dangerous, as pointed out earlier. The "Journal of Industrial Hygiene" reported in 1925 that, of a number of cases involving fatal shock at voltages below 250, 90 per-cent of the victims had marks on their left hands. This indicates that shocks through the left hand - hence, nearer the left side and heart - are much more dangerous than those through the right hand. Thus, if you tend to keep one hand in your pocket while near live circuits, make it the left. Fiction: There are no harmful after-effects if you survive a shock. Fact: If you suffer a shock and have sustained no apparent injury, it may not mean that your troubles are over. Electrical shock sometimes damages nerve tissue. This may cause a wasting away of muscle - a slow, progressive disturbance that may not become evident for weeks or even months. Other delayed effects may produce personality changes, amnesia, mental inertia, blood-vessel diseases, cataracts, destruction of the pancreatic tissues, and heart conditions. Table 1. Shock current intensities and their effects. So much for the effects of electric shock. What should be done if you see someone rendered unconscious by electricity? Every person who works near electrical equipment should acquaint himself with rescue techniques. The first step is to break the connection between the victim and the power source. If possible, do this by turning off the power. The next best thing is to remove the victim from the voltage source - without endangering yourself, Use a wood board or other non-conducting object. As soon as you can touch the victim safely, apply artificial respiration. Speed is essential. Any delay at all greatly reduces the chances of recovery. Of some 600 cases studied, over 70 per-cent of those receiving artificial respiration within three minutes recovered. Just one more minute of delay dropped the figure to 58 per-cent. If there is no heart or respiratory action and treatment is delayed five minutes, death is virtually certain. If you are alone, do not take time to go for help. Start artificial respiration immediately. If the person can be saved, you can do it as well as anyone. And don't stop even if the victim appears dead. Eight hours have elapsed, in some cases, before the victim responded. The only sure sign of death is rigor mortis - and only a physician should judge whether that condition exists. Above all, don't let the victim be you.